Those of us following would well know the retort to the Q : “So who’s your favourite male cricketer?” .. .. .. It is a question that people ask at dinners, presentation ceremonies and all other events ! But when the same question was put to Mithali Raj, on the cusp of the biggest cricket tournament in the female game, it wasn’t innocuous, it represented something more insidious. So Raj put a question of her own across in reply. Raj’s retort has gained quite a bit of traction in the media. News channels have picked it up. Amitabh Bachchan has tweeted about it. Raj herself, speaking on the eve of her match against England, downplayed it and chose to focus on the cricket. The 2017 Women's Cricket World Cup now on is an international women's cricket tournament – being played in England from 24 June to 23 July 2017. 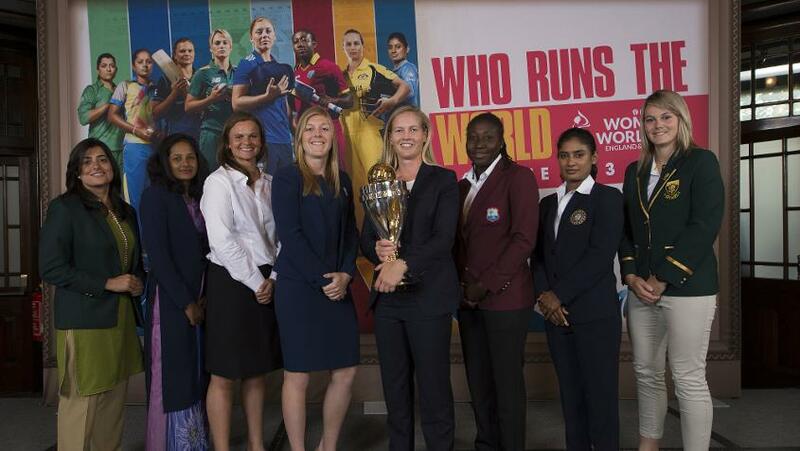 It is the eleventh edition of the Women's Cricket World Cup, and the third to be held in England (after the 1973 and 1993 tournaments). Quick info is that the first WC preceded that of Men which was played in 1975 !! Eight teams qualified to participate in the tournament. In one half is : Australia, England, India and Newzealand and on the other is Pakistan, South Africa, Sri Lanka and West Indies. The group stage is a single-league format with each side playing the other once. The top four sides following the conclusion of the league matches will progress to the semi-finals with the winners meeting at Lord's on 23 July. Therefore, a total of 31 matches will be played during the 28-day tournament. This edition of the World Cup will be the most watched, most covered and most well rewarded of all time. That also means it will be taken the most seriously, by players, spectators and the media. Women's cricket is largely covered as a novelty with stories focusing on obvious topics of breaking the gender barrier, fighting for funds and overcoming the odds. Is that set to change is the big Q ? The women's game has started to professionalise and with that will come all the pleasures and pressures of the spotlight. Apart from increased profile, they can also expect to be scrutinised, their performances analysed, their game-plans dissected, their mannerisms watched and their characters' trumped up or even assassinated. Aussie skipper Meg Lanning would look forward to winning ways - Australia have a remarkable record at the Women's World Cup, having won six of the 10 tournaments (England have won three and New Zealand one), but this is Lanning's first World Cup as skipper. The 1973 Women's Cricket World Cup was the first tournament of its kind, held two years before the first limited overs World Cup for men in 1975. The competition was won by the hosts, England. The competition was the brainchild of businessman Sir Jack Hayward, who contributed £40,000 towards its costs. England, Australia, New Zealand, Trinidad and Tobago and Jamaica were joined by an International XI and a Young England side in a round robin league which saw the top team win the World Cup. England topped the group with 20 points from their six matches, including five victories and one defeat, while Australia were runners up posting 17 points with four wins. The next World Cup was held five years later in 1978. 24th June 2017 @ 4.10 pm.